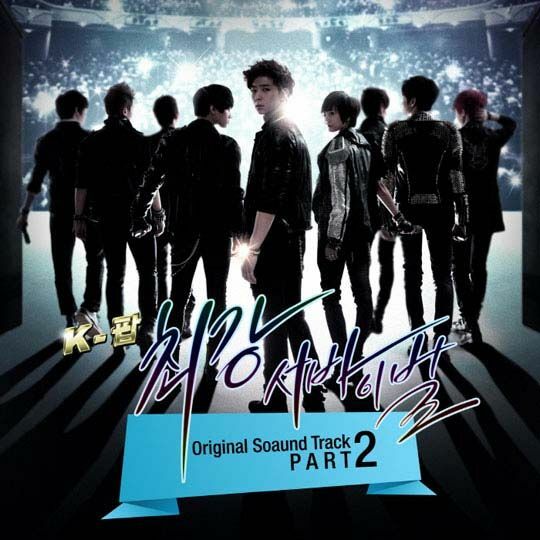 Channel A drama series K-Pop – The Strongest Survival (The Ultimate Audition) releases the second OST on March 27th, 2012. The lead actress Go Eun Ah transforms into a rocker for the OST, attracting attention. The song of K-Pop – The Ultimate Audition OST part 2, Stand Up (세상에 소리쳐봐), is the theme song of the idol group in the drama, M2 Junior, and the song has been featured in the drama, and is the favorite for many audience. The brisk rhythm and melody depicts sustained efforts of the members for their debut. Stand Up is sang directly by the various lead actors and actress in the drama, namely Go Eun Ah (고은아), Kwak Yong Hwan (곽용환), and Kevin, and is produced by popular producer Master Key. Listen to Stand Up (세상에 소리쳐봐) at YouTube. go baby! can’t you see it in ma mind? 안된다는 말은 쉿! 이제그만. 참 해도 너무해. 난 잘 한다고 했는데. 이 따위 변명같 은것도 모두 지워버릴래. 하루하루 지날수록, 버티기 힘들수록. 아무리짓 밟아도 난 상관없어. 내 꿈을 향해서 난 V.I.C.T.O.R.Y! 뜨거운 내 마음을 꺾지 못해. Don’t deny it! 비겁하게 숨진 않아. 이젠 부딪혀 보는 거야. 포기못해. 항상 바래왔던 꿈을 향해. 내 앞에 펼쳐진 무대로 달려간다. 처음 부터 쉽진 않아. 한번 끝까지 가는 거야. Go 이제 보여줄 때야 Go 힘껏 날아올라봐. 절대 흔들리지마. (Stand up)세상을 향해 소리쳐봐. 내 꿈을 향해 가면 gonna be a super star. (Stand up)사실 난 하나밖에 몰라. 꿈꾸면 모든 것이 이뤄진다. Never stop. 두렵지 않다고, 난.해낼수 있다고, 난 긍정의 힘으로 Everything is gonna be all right. 멈출 수 없어. 난 날 믿을 거야! Stand up. 꿈을 향해 All right. 가는거야. 힘들었던 어젠 모두 잊고 날아 올라. go baby! can’t you see it in ma mind? andwehn-daneun ma-reun shwiis! ije-geuman. cham haedo neomuhae. nan jal handa-go hae-nneunde. i ttawii byeon-myeonggat eunkeot-do modu jiwobeorillae. haruharu chinal-surok, beotigi himdeul-surok. amurijis balbado nan sanggwahneop-seo. nae kkumeul hyang-haeseo nan V.I.C.T.O.R.Y! tteugeoun nae ma-eumeul kkeokkji mothae. Don’t deny it! bikeobha-ge sumjin anha. ijen budijhyeo boneun geoya. po-gimothae. hangsang baraewaht-deon kkumeul hyang-hae. nae ape pyeolchyeojin mudaero tallyeo-ganda. cheo-eum bu-teo shwiib-jin anha. hanbeon kkeut-kkaji ganeun geoya. Go ije boyeojul ttaeya Go himkkeot naraollabwah. jeoldae heunteu-lli-jima. (Stand up)sesangeul hyang-hae sorichyeobwah. nae kkumeul hyang-hae kamyeon gonna be a super star. (Stand up)sashil nan hanabakke molla. kkumkkumyeon modeun geo-shi irwojinda. Never stop. duryeob-ji anhda-go, nan.haenael-su it-da-go, nan geungjeongye himeuro Everything is gonna be all right. meomchul su eop-seo. nan nal mideul keoya! Stand up. kkumeul hyang-hae All right. ganeunkeoya. himdeu-reot-deon eojen modu itko nara olla. Go baby! Can’t you see it in ma mind? Don’t say I can’t! That’s enough. You are just too much. I thought I am good. I want to erase all these allegations. As each day passes, it gets harder to sustain. I do not care how much I have been stepped on. I am heading toward my dream for V.I.C.T.O.R.Y! You cannot beak my passionate heart. Don’t deny it! I won’t hide cowardly. Now I want to clash with you. Stand up. Let’s start. Fly high. Shout it out. I will not give up. I look forward to my dream that I always have all the times. Louder. Scream. I will overcome. It’s not easy from the start, I’m gonna do it all the way. (Stand up) Actually I only knew one thing. If I dream, everything will come true. Never stop. I will not stop. I believe in myself. Stand up. Toward the dream. All right. I’m going forward. Because the wonderful world is waiting for me. Forget the difficult flight yesterday.